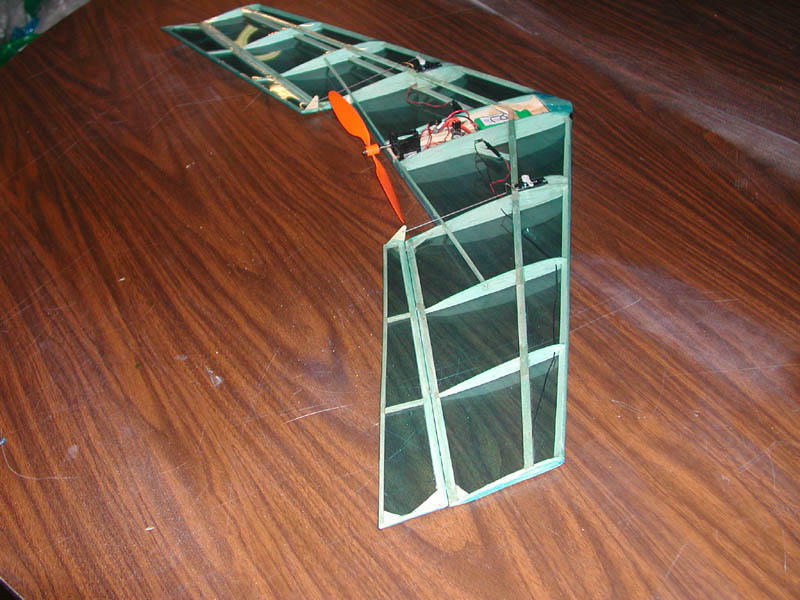 Wing thing #3 has been disassembled. 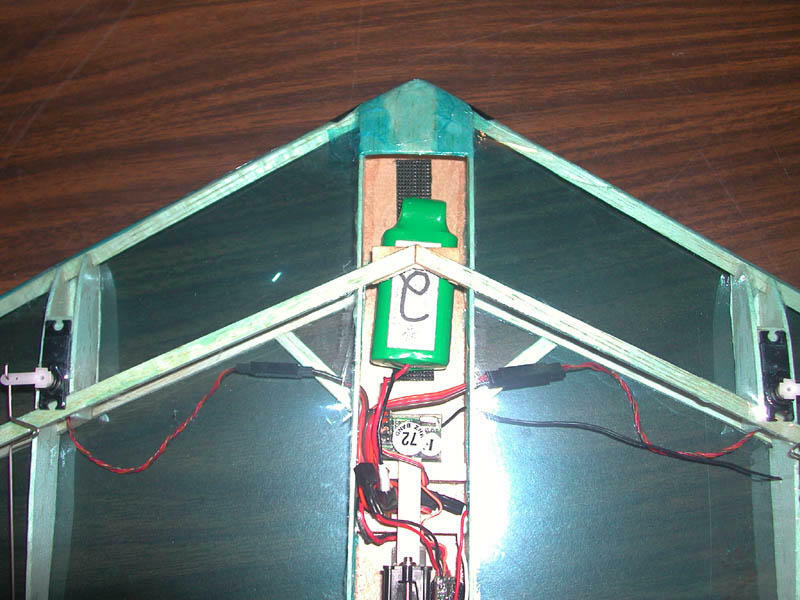 Somehow when I built it I got anhedral in it, not dihedral. I built it upside down, but still it got screwed up somehow. It flew, but was not really a plane. It was too much of a struggle to keep it airborne. I'll make a new one as soon as my bench clears off. Wing thing #3 completed. I'll get it trimmed out today to fly at NEAT. I didn't take any photos because it looks exactly like #2. 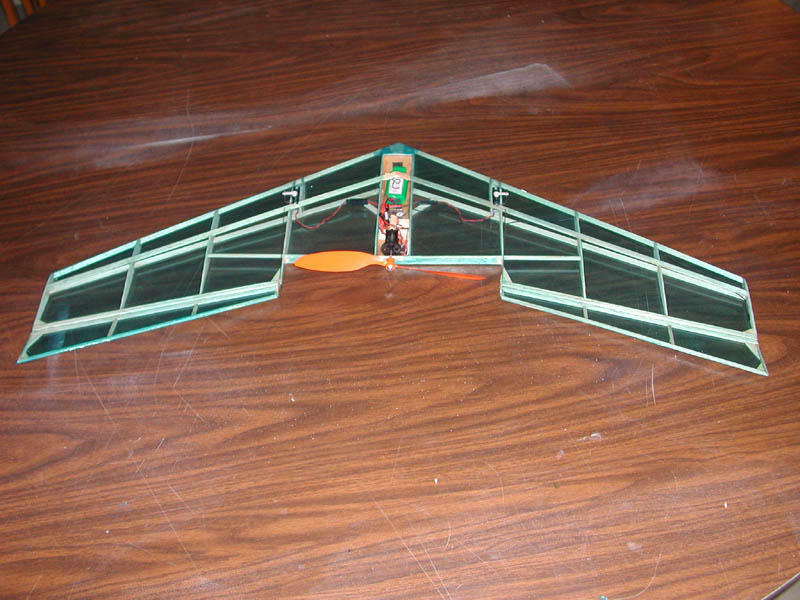 I used the elevons from #2 so I figured I should paint the frame of the wing black to match and cover appropriately. The only thing I did on this one different was to make the center section a little wider (mistake) which gives more room, but I don't know what it will do to the lift. We'll see. Wing thing #2 is finished. Flights are good, but I built it a little crooked I think as I get a little tip drop when it stalls. It's not that bad just a a little. This one still flies well. I added some Zagi-like wingtip fins to see if that would fix the problem. When I build this one I cut 4 sets of ribs out with the stack-and-sand method so I'll fly this one agressively and build another when this one is 'worn out'. Empty weight is 4.3oz/120g all up weight with 7-cell 280mAh NiMh battery pack is 6.3oz/179g. I left off the finger holes and added a skid on the underside to grasp while hand launching. Retained the 1/64" lite ply center section bottom and the wider center section from first model. Went with black spray paint on the frame at the expense of 1/10th of an ounce and covered with Rose and Yellow Crystal Renolds wrap. Found out the problem. It wasn't tip stall - my elevons were somehow not matched in their control throws. Adjusted the throws and now #2 flies like a dream. Dorked it in - time to build another one. Last night I looked at my building table and it was pretty much empty. My Yard Bee and Fokker D-VIII are awaiting a trip to the field for their maiden flights, and my favorite parkflier the Tiny was crushed by my toolbox falling over in the car. 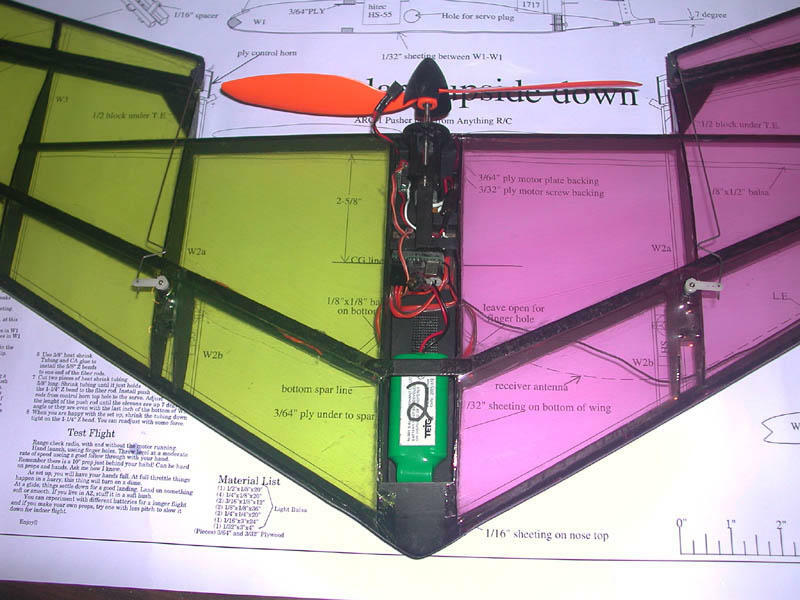 With another Tiny kit on order I had some time with a spare set of avionics. 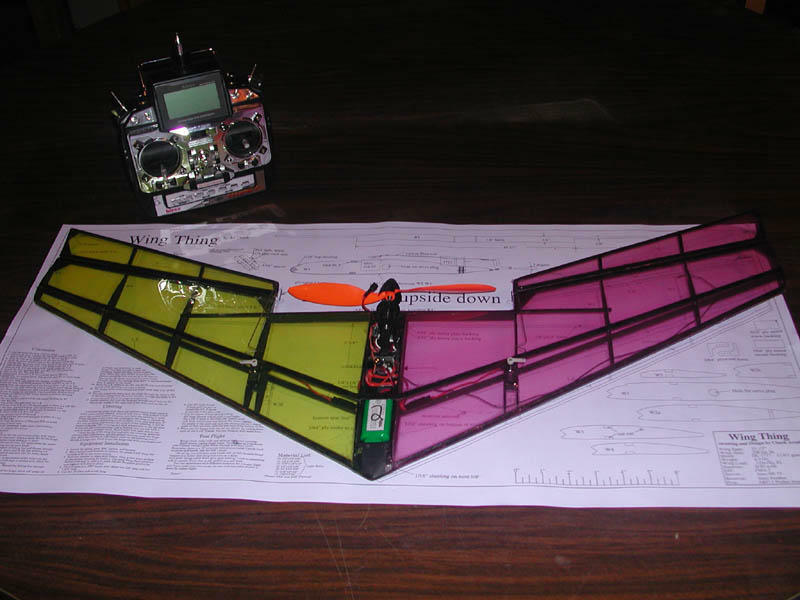 I always wanted to try the Wing Thing and I had already printed out the plan I downloaded from AZ Chuck's Wing Thing Website. Total build time was about 5 hours. Avionics are my standard setup of GWS 4P receiver, Castle Creations Pixie 7P ESC, 2 GWS Pico servos and GWS-A motor/gearbox. I was out of 10x4.7 and 9x7 props so I took a 9x4.7 I had and twisted some extra pitch in it. I made two modifications, widening the center cargo area to fit my 7 cell NiMh packs and sheeting the underside of the center with 1/64 lite ply instead of 1/32 balsa. I widened the center by simply sliding the center ribs apart and trimming them appropriately. This model lived a short but very fruitful life. Let me tell you this plane is a complete winner. 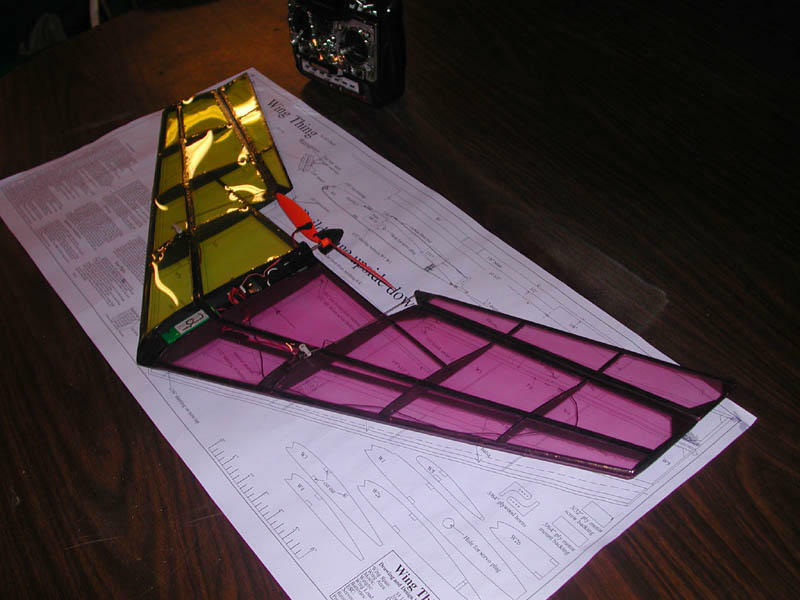 Maiden flight was uneventful and I had it trimmed out about one minute into the flight. I tested it at the department BBQ we have each summer. Spectators were around 75 and all were impressed. After about seven flights I started hand catching and doing maneuvers on command. 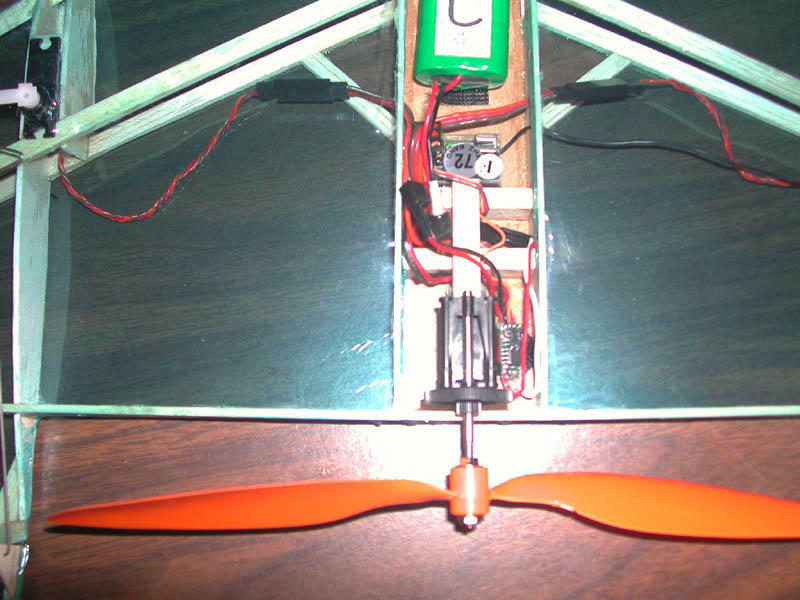 Inverted flight is great, loops from level flight, outside loops on fresh battery. Rolls are a little slow but doable and on full rates almost axial. My friend Tucker had his litestik in the air at the same time and in a couple of the movies you can compare the two planes' speeds. By the end of the day I was flying down a 50' wide gap in some tall trees about 125' long at the request of a co-worker. This worked fine but wat very tricky. Eventually I caught a tree. 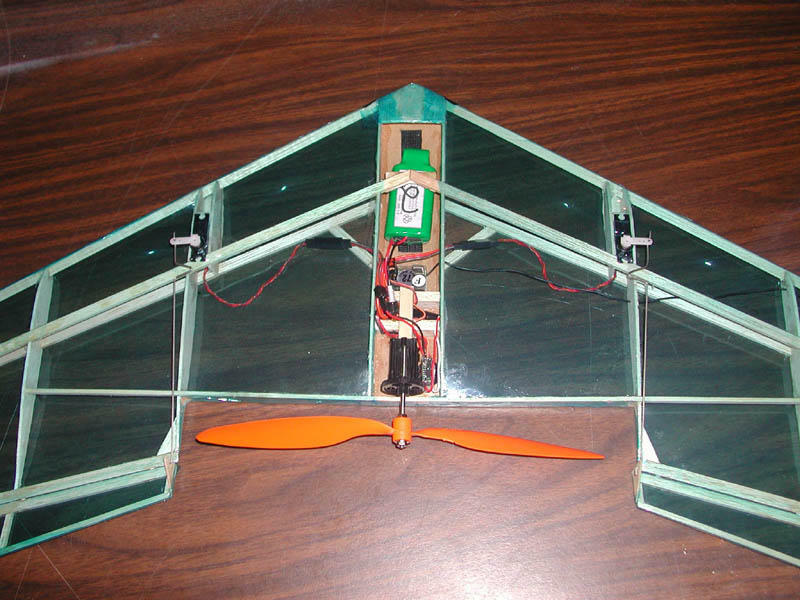 Funny thing is it builds so fast and is made of so little balsa that I didn't even feel too bad about it. I'm keeping this plane in the 'On The Bench' section because I liked it so much I'm going to start working on a replacement ASAP. Total lifespan from bench to graveyard: Less than 24 hours. Total flights - 12 or so. My second wing thing won't have the finger holes for launching since with my large hands I found the holes hard to use. I plan to fit a 1/4" x 1/2" balsa keel to the bottom to grab when launching. This may also protect the underside covering a bit.